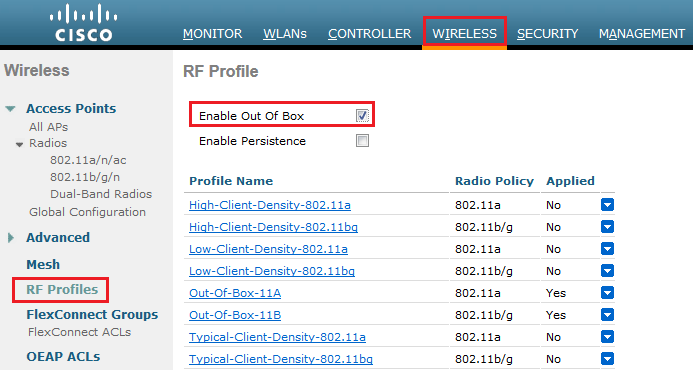 Out of Box is a really good feature added by cisco; basically it’s a special RF profile for new APs to join the network. This feature is designed to eliminate RF instability due to out of box APs. AP Group and Shut Off their radios. If new AP joins to the network it will be moved to Out-of-Box RF profile and their radios will be administratively disabled. This eliminates any RF instability caused by the new access points. All default-group APs that subsequently associate with the controller (existing APs on the same controller that have dropped and re-associated, or APs from another controller) are placed in the Out-of-Box AP group. Special RF profiles are created per 802.11 bands. These RF profiles have default settings for all the existing RF parameters and additional new configurations. When removing APs from the Out-of-Box AP group for the use, it’s recommended that we assign the APs to a custom AP group to prevent inadvertently having them revert to the Out-of-Box AP group. When we disable this feature after enable it, only subscription of new APs to the Out of Box AP group stops. All APs that are subscribed to the Out of Box AP Group remain in this AP group. We must manually move to these AP to different AP groups. This feature is automatically turned-off upon rebooting the controller. It has to be manually turned on! System will now restart! Restarting system. Solution: To solve this issue, we need to enable Persistence as well. Same as point 1 but…..If the AP isn’t moved to another RF group (other than the default) it will be added to the out-of-box group after every time it joins the controller. Update(May be a BUG): One more thing I noticed that APs both radios are down ….even after moving an AP from Out-Of-Box to a different AP group. Hi, do you know if that “bug” been fixed (or if there is a workaround)? I have preconfigured 200 APs and put them in their respective AP Group. I will turn them step by step and I do not want to manually activate the radios. I did not test the newest version! You can ask this question on CSC.